Residents view devastation caused by the earthquake in Shangla District, in the Khyber-Pakhtunkhwa province of Pakistan on 26 October 2015. 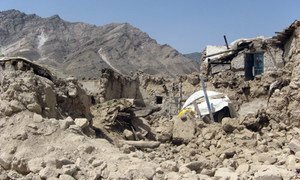 Hundreds of people have been killed and thousands of homes in Afghanistan and Pakistan were destroyed by the massive 7.5 magnitude earthquake that struck the Badakshan Province in Afghanistan yesterday, according to the United Nations Office for the Coordination of Humanitarian Affairs (OCHA). World Health Organization (WHO) spokesperson Christian Lindmeier, speaking at a press briefing in Geneva today, said figures from health facilities in the area reported 300 injured and 21 deaths as of this morning. WHO's priority, he continued, is to help the health authorities in both countries to provide assistance to the people in need. WHO is concerned about health needs in addition to immediate traumas, including waterborne diseases, diarrhoea, dysentery, hepatitis A and E, acute respiratory infections, post-traumatic stress disorder, infected wounds, malaria, and dengue fever. UNICEF Afghanistan and Pakistan are working with national governments to deliver life-saving supplies to tens of thousands of affected children and their families. UNICEF has also cautioned that health, nutrition, hygiene and education services will now be under exceptional stress, placing more children at risk. United Nations agencies are mobilizing and stand ready to support Government-led relief operations in Pakistan and Afghanistan, Secretary-General Ban Ki-moon said today, adding that his thoughts are with the people of the two countries after a powerful earthquake struck Badakshan province in Afghanistan.